Earlier this month, I taught an illustration workshop at La Galeria Roja in Seville, Spain and it was a dream. A dream! Spain was beautiful, old, inspiring, and lovely, but I have to be honest...the thing that made the whole experience unforgettable was the students. I hit the freaking student jackpot. 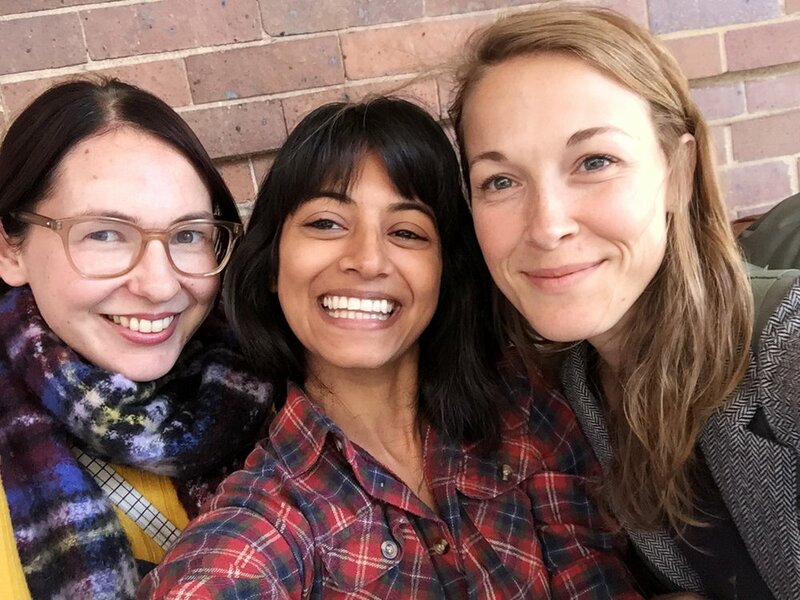 I was also joined by my pal, Meera Lee Patel to assist the class, and our lovely translator, Carmen who is also a rockstar person and incredible artist. Before the workshop, I emailed a survey to see where the students were in their level of experience with illustration, materials, and publishing. The range was wide, some of the students just stepping into illustration. Others had worked in the industry for years, all while simultaneously managing families and the like. (Which is a workshop I’ll need to take someday). 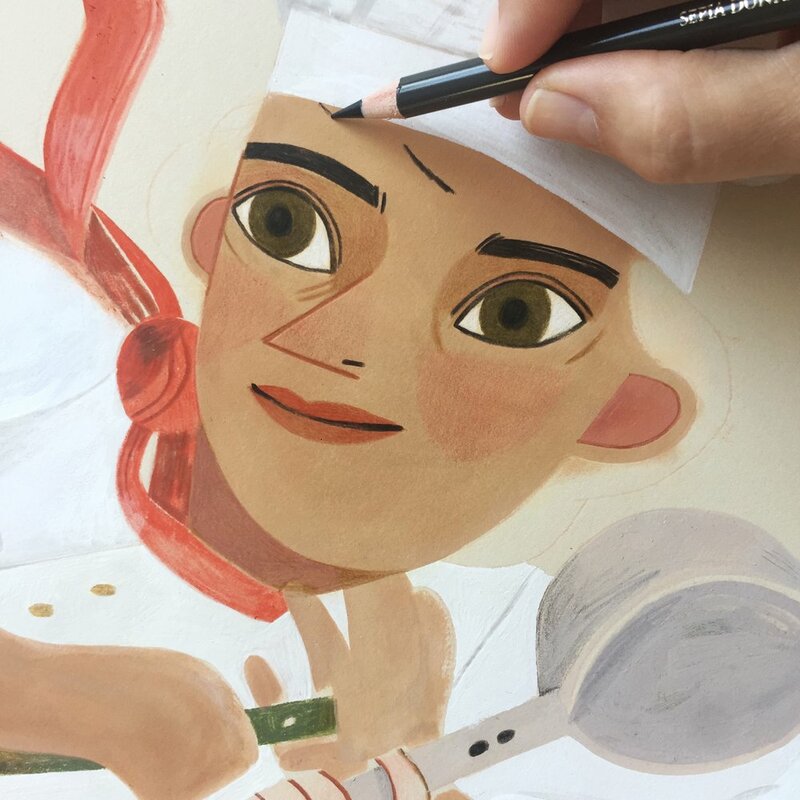 To compensate for the range of experience, I created a workshop which would give the students a basic foundation of narrative illustration while also introducing a material component, which was working with gouache and colored pencil. The assignment was to create an interior illustration from a book. I chose to do the demo based on Roald Dahl’s The Witches. After beginning the class with a presentation on the evolution of my work over the last ten years, we warmed up with a drawing exercise and then launched into the project. I outlined scene selection, character development, page layout and design, and color palettes. The second day started with a gouache and colored pencil demonstration, where I painted six of the same objects in black and white, showcasing how many different variations the materials can produce together. Afterwards, I had the students do the same to familiarize themselves with the materials. I then launched into a painting demo where I spent two hours attempting to complete a painting (yikes!). I was also challenged to drawing cotton candy (challenge accepted!) and thanks to Marieke and Julie and their candy finger trick, I did just that. (Then I think Meera spent the next hour just painting cotton candy! Ha) Where’s my photo of the cotton candy drawing when I need it? Students then spent the second half of the class planning and sketching their own artwork for the assignment. I have to say, the varied and creative approaches were incredible to see. Each student not only had a sense of their own style and direction, but each also had a goal in mind . They all left their comfort zones to create something new for the class, and we all know how scary it is to create something out of your usual realm. The third and final day was a full workday, where students painted their illustrations. I walked around giving feedback and it was so rewarding to see the students pushing themselves, eager for direction and suggestions. The last hour of the class we all shared our work and I was able to give each student feedback on their process and final. GUYS. Their work! We had so many unique styles and directions and perspectives. Every artist had their voice just shine. It was a highlight of my career for sure. I really can’t thank the gallery enough, or the students who attended, or my friend Meera for all her hard work, or Carmen, for translating the magic. Dream dream dream. After Seville, we took the train to Barcelona and stayed with one of my long time favorite illustrators, Julia Sarda, who graciously gave us a place to stay. Julia is a fiercely talented, hard working and passionate person. I’m so inspired by her work. Meera and I spent our days wandering in and out of bookstores, eating amazing food (we ate at Flax & Kale like three thousand times) and went to the Picasso Museum, which ignited my artist heart. I also walked into the cutest children’s store, kmfamily, in Barcelona, and the gal there knew me and my work which just sent me over the moon!! She said her stepdaughter and her practice drawing with my art and I melted. We met Julia’s studio mates, who are a warm and talented bunch and were so inviting when we came to visit their studio. I also met a longtime favorite paper artist and illustrator, Mar Credá. She is a stunning and compassionate human and I’m so glad we met. We also got to hang out with our new pal, Marieke who now lives in Barcelona and met up with us each day. We saw the ocean and drew together on a park bench by Sagrada Familia. It was tough to say goodbye to such a magical place, so I’ll just say see you later. Scroll down for a boatload of photos! Also: A note on travel anxiety. 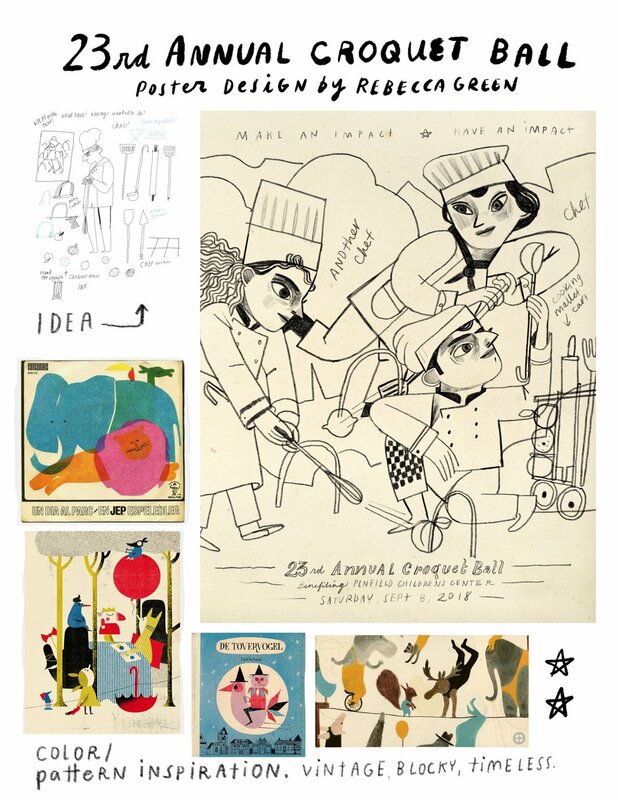 I was recently invited to create a poster for the Penfield Children's Center Annual Croquet Ball, which took place this past weekend. Penfield Children's Center, in Milwaukee, provides early education, health services, and family programming to infants and children in need. Creating this poster was a rewarding opportunity for two reasons: First, it's always been important that I give back to communities in need, using my work to perpetuate compassion, education, and understanding. Second, donating illustration generally means absolute freedom. This freedom, of course, means the direction is wide open, and it's therefore my responsibility to understand what I truly want to make. Quite a daunting task. If you've ever stared blankly at an empty piece of paper, you understand. I'm trying to know my creativity better, narrowing in on cues - indulgence vs work, my strengths vs strengths perceived by others, etc. Lately I'm discovering that I love to mix worlds. So, I combined my love of combining with something else I adore: FOOD! 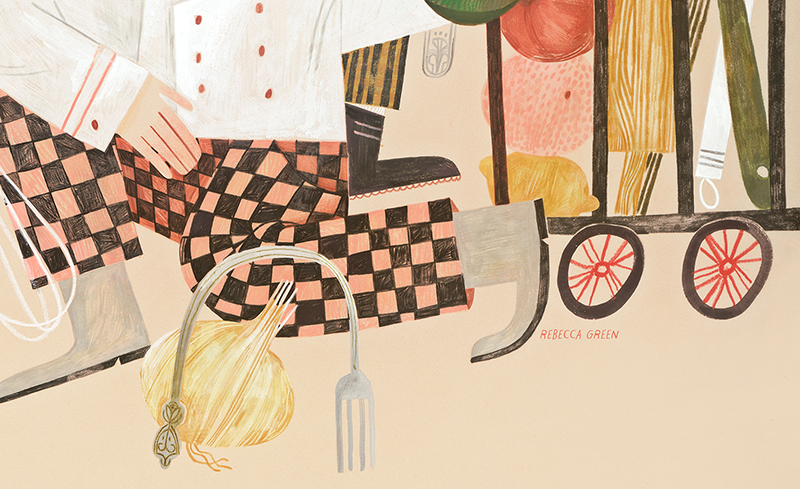 I've long had an obsession with drawing chefs. 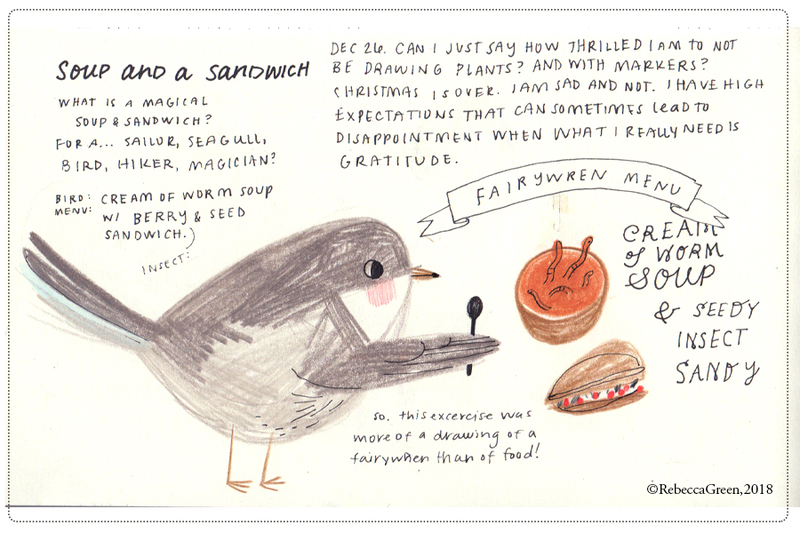 Possibly because in another life, I'd like to be one, but I've always loved drawing food and people working with it. I'd spend hours as a child drawing fruit and vegetables on MS Paint, and I sculpted chef after chef in clay. One look at my portfolio won't tell you this, but I never actually execute these drawings in a way that makes sense for my professional portfolio. Being an idiot is the only explanation I can offer for this. Work from Unknown, CIAO DA ISRAELE, Catarina Sobral, & Ted Schaap. For the concept of the poster, mixing in chefs was easy - they'd simply play croquet! I decided to have them use food for the croquet balls, bent utensils for the ground thingies and kitchen tools for the mallets. I pulled some work for color and visual inspiration and after approval from the client, I went to work. The poster was quite large (26x40") and in order to transfer the drawing onto my paper, I had to redraw the illustration on a large piece of tracing paper (that I taped together). I then put pink chalk on the backside of the tracing paper and transferred the lines onto the paper. (I forgot to take images!) I then created the final in pan pastel, gouache, colored pencil and water soluble crayon. I limited my palette to olive greens, ochre, salmon, and some rusty coral colors and worked on a fawn colored 22x30" sheet of Arches paper. To create the poster, I had the illustration professionally scanned (because of the large size) and then I photoshopped more room on the top and bottom for the text. I created most of the text by hand, scanned it in and edited everything in PS. And the poster was complete! Here are some closeup images of the illustration finished. Thanks again to the folks at Cramer-Krasselt for bringing me onto this project to Penfield Children's Center for providing invaluable services to your community. What an all around win! Smithereens, Post No. 8: Expressions! A couple of years ago when I dove into the publishing world, I learned quickly how little I knew about character development. Not only did I have to draw a character consistently, but also to individualize and understand their range of emotions. This is unfortunately not something I learned in school so it’s been an interesting journey to find a way to convey expressions in my characters. Because the lines are so simple and sparse, every little nuance or tick can drastically change the entire mood and emotion of the situation. For this reason, it usually takes drawing the characters 6 million times before I start to see their personalities come out. Once that’s done, I can play more with their emotions. The most valuable tool I can use to understand and convey emotion, is to feel it myself. I think we all tend to do this when drawing emotion. It really helps to 'act it out'. (Good thing we spend a lot of time drawing alone, since we'd look rather odd weeping or looking vengeful while working (although now that I'm thinking of it, those are emotions that come up while making art too!) When I need to find the best stance, facial expression, etc. for an illustration, I literally just act it out while paying attention to my own body's instinctive actions. When proud, my chin goes up. When nervous, I shrink. When eager, my eyes open and my body moves forward. Last night when I was drawing these next studies, I asked my husband to act out these emotions and he almost exactly copied my postures! Now, we're two in billions, and all humans have different ways of feeling emotions. For some, proudness might be quieter, fear might be running instead of freezing, eager might still look timid. It's our responsibility as illustrators to understand the characters enough to be able to accurately portray not how we would feel, but how they would feel. Besides body posture and color, one of my favorite ways to portray expressions is in the eyes and eyebrows. You can have the simplest lines and still put so much emotion into a face. Below are some examples of what can be down in just a few strokes! Now that I have the hang of creating basic characters and emotions, my goals have shifted and expanded. In the future, I'd love to vary my character shapes, adding personality into their build. I'd also love to add more movement in my work, showing emotion through lines and layout, rather than having all of the focus be inside the character. I want people to literally get swept up in the emotion. I don't want to make you weep, but I want to make you weep! Make sense? What tools have you found helpful in creating dynamic characters and expressions? What's the hardest part of portraying emotion in your work? Alright guys! I hope this weekend is filled with all the best emotions and expressions. Happy Friday and Happy Expressing! 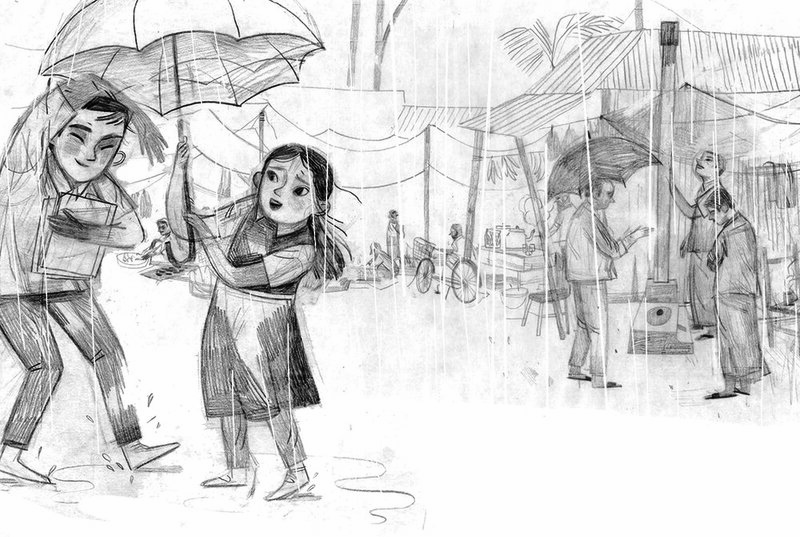 What goes on behind the illustrations in a picture book? (I'll give you a hint...way more work than I ever imagined!) I'm just skimming the surface, having only finished three, but each one gives me a new light into what I know, what I definitely don't know, and how I can improve. 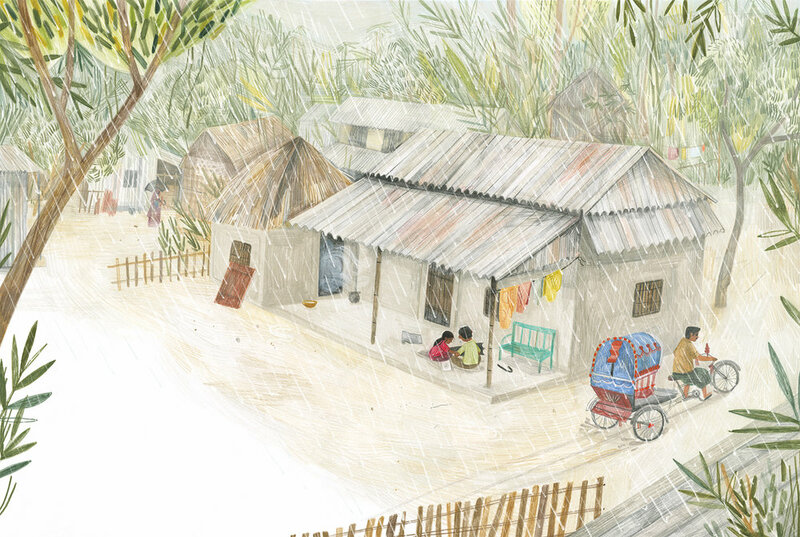 "It's monsoon season in Bangladesh, which means Iqbal's mother must cook the family's meals indoors, over an open fire. The smoke from the fire makes breathing difficult for his mother and baby sister, and it's even making them sick. Hearing them coughing at night worries Iqbal. So when he learns that his school's upcoming science fair has the theme of sustainability, Iqbal comes up with the perfect idea for his entry: he'll design a stove that doesn't produce smoke! With help from his teacher, Iqbal learns all about solar energy cooking, which uses heat from the sun to cook --- ingenious! Has Iqbal found a way to win first prize in the science fair while providing cleaner air and better health for his family at the same time?" 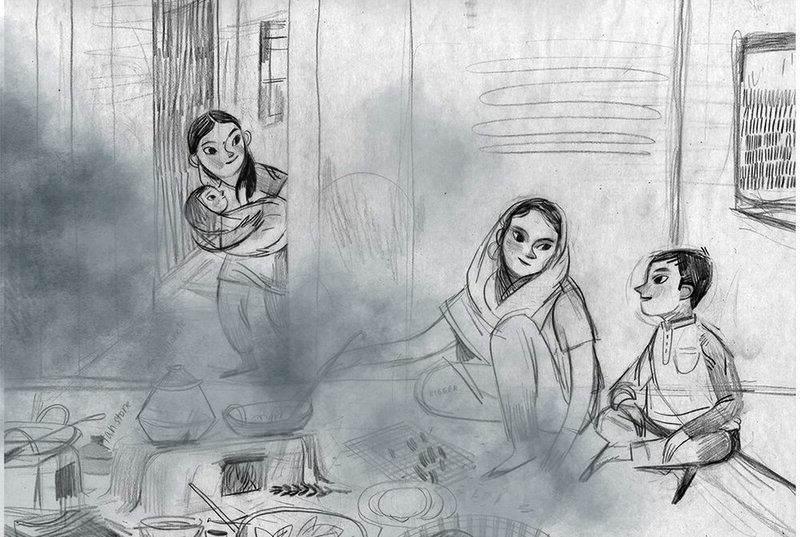 Once the publisher had approved the initial hand drawn look of the first sketches, I developed the main characters, Iqbal and his sister Sadia. 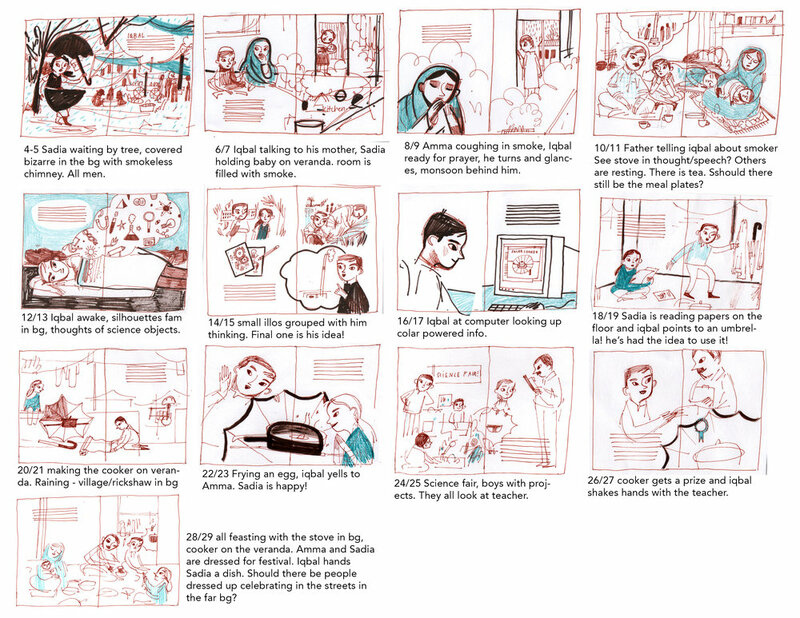 I then drew thumbnails to share an idea of the layouts and concepts. I find it best to work this simple from the beginning so if there are any major changes, they can be addressed at this stage. The Art Director made suggestions on adding more white space and varying the perspectives of the illustrations. I tend to draw everything from eye level, but I'm trying to challenge myself to add interest in the from of perspective (worm's or bird's eye view) or adding the ground in at an angle. These drawings are only about 3-4". Once we finalized the layout and design, I sketched the drawings at full size, which was around 9x18" (I draw them in spreads, meaning both pages at once). I draw most sketches in blue or black colored pencil. 1. Make it simple. I did too many drawings here - between the sketches and linears and finals, I was essentially drawing the same thing three times and that's where I start to lose my spark and spontaneity. 2. Check the size before finalizing your material. I would have saved lots of time had I allowed myself to use gouache or watercolor as a base layer. Alas, I'm happy with the colored pencil look, but it added lots of extra hours. 3. Add variation and white space. This is a hard one for me. For some reason, I always plan for illustrations to be rectangles with full bleed. I'm trying to loosen up and not cover every square inch of paper. 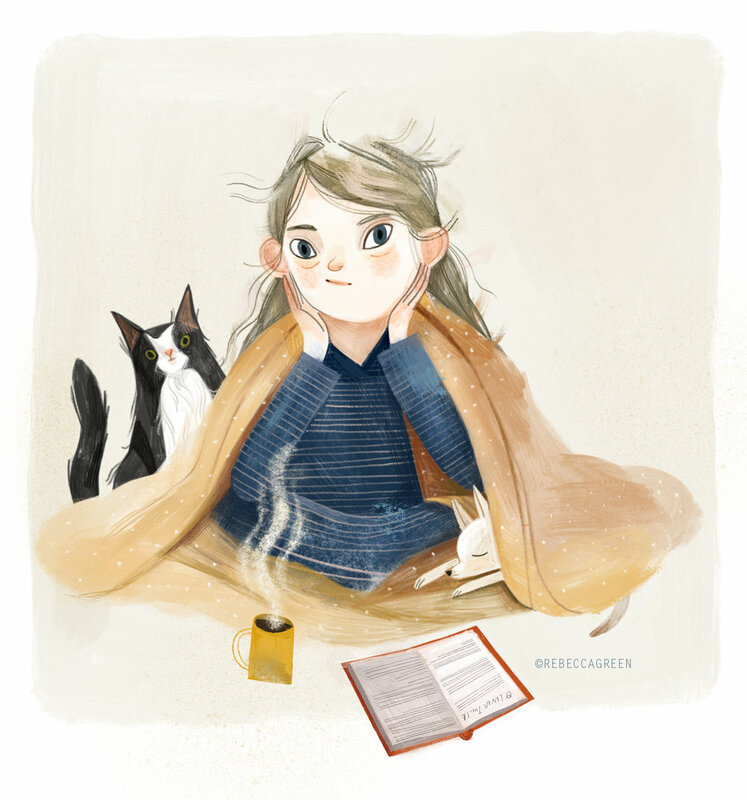 Have you worked on a picture book? What are some of the lessons you've learned? I'd love to hear them! 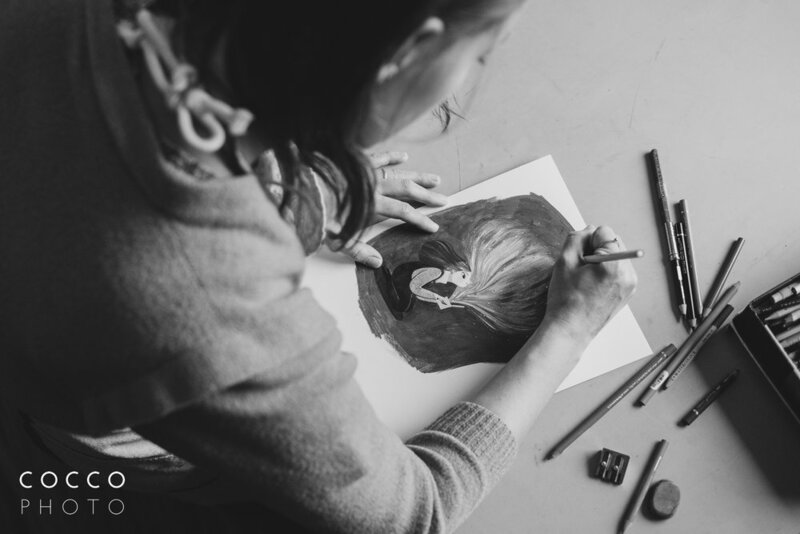 "This kourse is designed to inspire your creativity as well, by immersing you in the lives and the studios of five brilliant artists who use their sketchbooks as incubators of stories, emotions, and vivid new worlds. We’ll learn by sharing their step-by-step process in a 12 different demos using everything from gouache, markers, ink, crayons, collage, iPads, colored pencils, watercolors, pastels, and more. Their passion and invention is sure to rub off on you every week, and inject creativity and whimsy into the pages of your sketchbook too." Instructors include: Mike Lowery, Vanessa Brantley Newton, Miriam Bos, Anna Denise Floor, and myself! If you're interested in signing up, the class begins June 18! Blue will be the death of me. Green, green I can do. (Not just because it's my last name!) What about grays and ochres and peaches? Yes. But blue, it confounds me every time. I just double checked the portfolio page on my site and sure enough, you'll be hard pressed to find a sufficient amount of blues. It's my goal to conquer it - perhaps I should just do a painting of all blue fruit! What a lovely challenge that would be. There are a myriad of ways artists can choose color palettes. Because it'd take me hours to dig into the world of color theory, I'm going to stick to what I know and use on a daily basis when choosing colors. It all comes down to one word, which I learned from Vyanna Slattery, my Design Drawing teacher in college: Matrix. This Matrix was his way of explaining the hue that encapsulates a piece, or that's how I understood it anyway. It's the lighting, environment, and overall atmosphere of the world you're creating. It's what really ties the whole image together. This is the very first thing I consider when starting a piece and it simply reflects the time of day, location, and the intended mood. While I like to experiment using a strict limited palette, what I'm sharing today is an overview of illustrations** with multiple colors - but how I narrowed them down to specifically capture a mood. Generally, the color scheme is the first thing I plan - and by plan, I mean I just concoct a dreamy image in my head. I then dig through all my art supplies to find the colors that feel right for the project. This narrows my choices but still gives me range to explore the palette without having a strict limited number of colors. For instance, in the above illustrations - I would pull out all my purples, grays, peaches, etc. and intuitively use those as I move around the piece. As you can see in all of them, they have a secondary warm or bright color that shows up in 2-3 places. 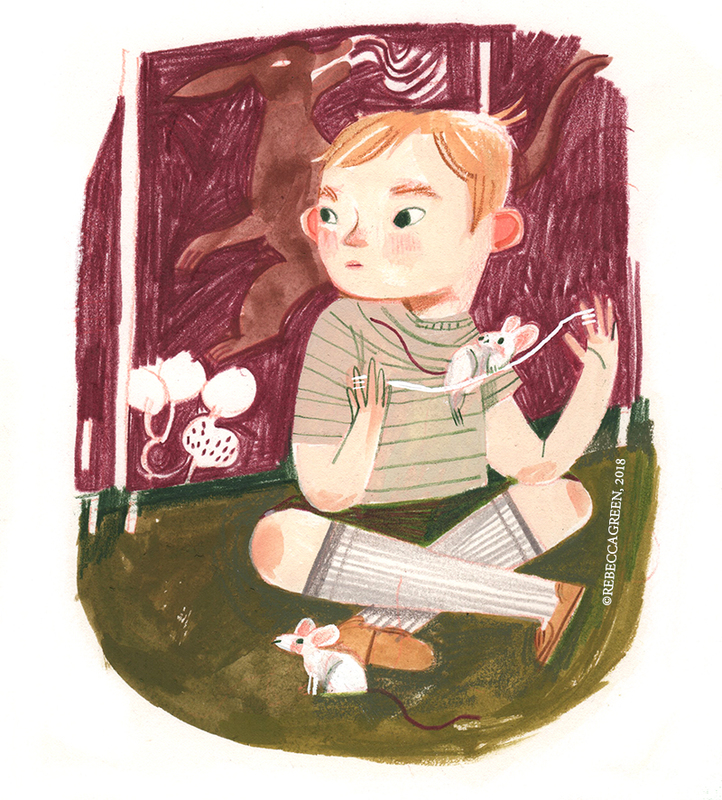 I use these spots of color to balance out the illustrations and create movement. Same for the the lighter, more golden toned pieces. These older paintings would sometimes get a golden/umber glaze in oil over the entire piece to pull them together into the same lighting and atmosphere. Now that I'm working with water based mediums and can't rely on a coating to filter everything through the same lens, it's more imperative than ever to think about the atmosphere from the beginning. Because I don't entirely pre-plan or map the colors, I have to sometimes redo paintings, or change and layer different colors a couple of times until everything is balanced out. This is just part of the learning process and the more I paint, the more I find what colors work earlier in the process. If you are nervous about color, placing your drawing in a digital format might help you map out colors. This does not work for me because I'm terrible at digital coloring! Once I became a little more comfortable with color, I could start to add interest to projects, like the illustrations in A Little Princess. I created 19 interiors for the book and each illustration had a main thematic color, either to accentuate the environment, or create variation among the pieces. So what do you do once you have your colors all picked out and ready to go? I like to fill in larger areas first - just get the big colors down. Then you can start to add in patterns and texture, and decide where your accent colors will go. Balance out your shadows/dark areas and take advantage of your highlights - those can really make an illustration sing. And don't be afraid to mess up - you might have to do a painting 3 times before you've really found your groove with the color. What sort of process have you implemented when choosing color palettes? What is a color you just can't seem to wrap your brain around? Whatever it is, I think the most important aspect of creating a palette is choosing the colors that really speak to you - when you use those, your intention is sure to come out in the final. **A lot of these illustrations are very old, so please excuse the fact that they were all basically self portraits, thus the lack of diversity. I'm happily working on newer illustrations that incorporate humans of all kinds, and I strive to be more inclusive with every piece of art I make. xo. Drawing people was 'easy' when I created realistic work in college. Yes, there were formulas and there were rules....but there were formulas and rules! When you're trying to draw real people in your style, that's where things get tricky. Because the equations and guidelines just sort of fly out the window, don't they? How can you look at a photo (or ten photos) of a person and draw them in your own visual style without getting too caught up in the realistic details? I've spent the last ten years doing just this and have created some little formulas of my own - take that realism!! Would you like to know this super complicated, very tricky, and almost impossible wizardry? Four Words: Put the photo away. Not at first of course, you'll need to look at something! And I'm getting ahead of myself. Let's start from the beginning, shall we? 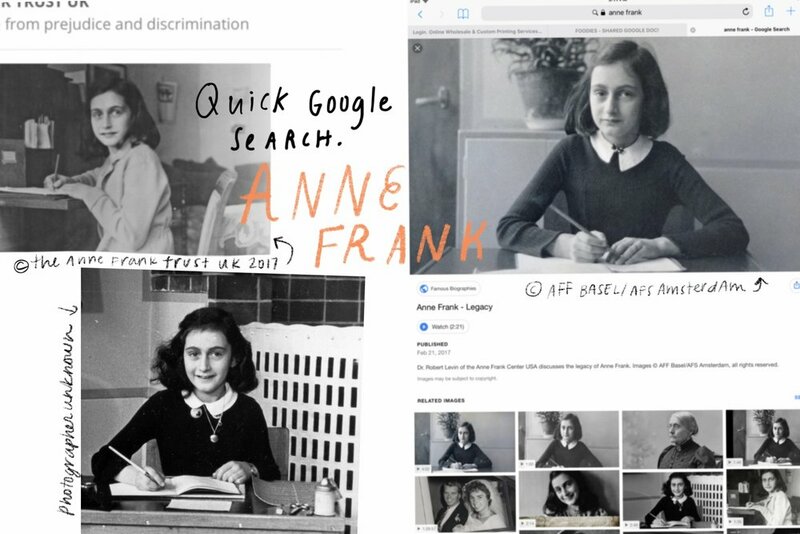 *Today I'll be drawing Anne Frank, who is someone I've always been inspired by, though just thinking about her and seeing these images busts my heart open. I realized I didn't have a clear example to show you with my previous work so I did a quick sample of the this process for this post. 1. Gather references - dig online, go to the library, request photos - and if you can take the photos of the human yourself, do that! 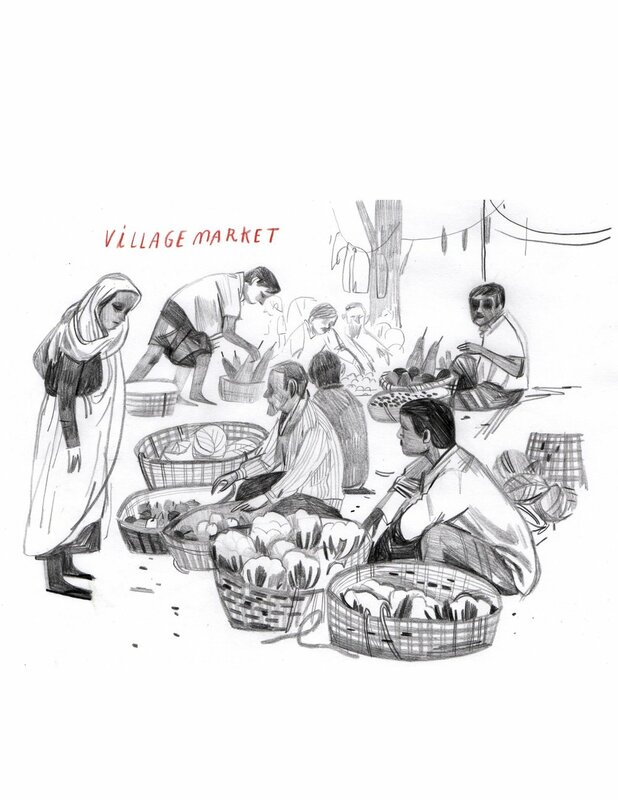 Also great to gather references of clothing, backgrounds, any small details that might add personality and story to the illustration of your subject. What time period, culture or location are they from? Can you add pieces of these realms into the illustration? 2. Draw, draw, draw. This is my least favorite part (and the sketches I'm least likely to share!) but it's necessary. Don't try to make anything too perfect, just pay attention to the features and characteristics of the subject. The shape of the face, eyes, eyebrows, the shapes of the nose, or the hairstyle - these are all monumental features in a person. Draw objects, clothing, etc if you think those will be helpful in the final illustration. 3. Here we go: put the photos away!! You don't need them anymore - you're now working solely off of your first studies. Do a second round of sketches, just by looking at your initial drawings for reference. Try to mix up posture, perspective, layout, etc. to make the drawing your own. Remember - it's the goal to break away from the photos. 4. Ready for it? Again! Put the first set of drawings away! For the third round, you'll only be drawing from your second round of sketches. Is it starting to feel more like you? More in your style? Usually at this point, I start to see the character evolving in my style and I feel more comfortable capturing their essence in my own visual vocabulary. 5. Start your final! Once you settle on a sketch and you've got your line work done and ready to fill in, start painting (or screen printing or drawing or inking, or whatever you do!) I usually don't go back to the initial references, but if you need to peek at details like eye color or clothing, do so, just put the photo away again. Remember, this is a creation from you, not a photograph. ** Since this is a quick example, I left out a lot of details in my drawing - like the pattern on her diary, flourishes that would have allowed the viewer to know where and what time period she's from. I really recommend building those details into your final illustration. And what's more - this wizardry works not only on people, but animals, plants, buildings, and anything you want to stylize. This process has helped me tremendously as I've had to research for illustrations, while keeping the drawings in my style. Do you guys have any tips that you've found helpful for translating real life into your personal art approach? Art is a process - making anything is a process. Living is a process! We often see what comes at the end of this process: the shiny beautifully wrapped effortless painting, the gorgeous illustrations in a book, the magazine cover we can't stop staring at. It's a wonderful thing to be propelled by these pieces of art, but it can definitely hinder us too. Like many of you, I love seeing behind the scenes. What decisions were made, and how they affect the outcome are more fascinating than the end product. I've been making art long enough that I've recognized my process pattern (though I'm still learning!). I know it takes me dozens of attempts to finally land on the one. And that sometimes that one isn't the one at all, and I end up ruining it, and seeking a new contender for the final piece. Lately, I've been doing preliminary work on the IPad, and it saves SO much time. I have thoughts about my digital vs traditional work and that'll come in another Smithereen post, but for now, it's a super easy way for me to visually explain process. Today I'll be sharing the process for Storytime Dreaming, a mural I painted at Parnassus Books last year. Though I started sketching ideas loosely on paper, I did the bulk of the planning in Procreate (with the default pencil brushes). Below you can see the evolution of the animals, and how I placed them in the final design. As you can see, I tried many different animals, views and options before settling on those that made their way to the final. Once the design was approved, I created the illustration in colored pencils (with digital edits) for a poster that the bookstore could print and sell. This made the color planning for the mural easy! Then came the actual painting! I projected the mural onto the wall via a projector and did the lines in white paint (that I knew would be covered up). I used a high quality wall paint and mixed in acrylics where I needed some differences in color. What I want to highlight here, is not necessarily the project per se, but the process it took to get to the final. There are always so many drawings and attempts that don't get shared, and often when I go back to share my process, I'm even surprised at how many times I had to circle around the piece before I ended up settling on the final. It's never a straight line, but a zig-zaggy mess of exploration. If you'd like to see more posts about process, check out The Great Cape Breton Escape or The Unicorn In The Barn . Also, this post has made me realize how little of the process I actually share with you. My goal is to be better at sharing the whole process and not just the sketches I like! What do you notice about your own process? Do you usually go with your first attempt? Do you have to draw something a hundred times before it's good enough? PS! I was under the weather on Friday, so I'm getting this post out to you a little late! Hope everyone's weekend was great! These last couple of months found me at an all time low. You might remember me sharing what was quite possibly the worst burnout I'd ever faced. I still can't say with certainty that it's over, but what I can say is that despite feeling a complete aversion to drawing, I did not give up visual journaling. I started consistently journaling last year, partly due to personal situations, but also, it was the only act of creating that I felt was mine. I didn't have to share it, in fact I planned on never sharing it. Don't get me wrong, sharing my work with anyone who wants to see it is one of the most rewarding and uplifting things about making art. But with it, also comes sort of an unspoken constraint. We feel we must constantly share for fear of falling behind, or worse, being forgotten. And when everything is on display, that tiny sacred spark can feel vulnerable and out in the open. That spark can even go out. It didn't even occur to me that while I was stifled by art, I loved sitting alone for sometimes hours, doing just that: writing and drawing. It hadn't presented itself as art because I saw it as a way to be present, record my life, and celebrate moments instead of overthinking and overcomplicating the process. My lines were unburdened by my usual thoughts: "Is this your style? Doesn't it look too much like this person, or that? Who's going to buy this? Is this what the client wants? How do I draw this, and why do I feel like I don't know what I'm doing? Who am I? What will people think? I'll just erase this and start over 8000 times.". I use ink so I can't erase. I use black so I don't have to think about color. I draw what I see, what I remember, and often how I feel - which keeps things simple. Truly, these pages feel indulgent and personal, and I find myself. My source and creative spark comes out when I just let my hand record my days. + My visual journal is a space that is all my own. No comments, no interference, no expectations. It allows me to be really intuitive about my line work and my thoughts. + I have a long standing record of my everyday. I love the idea that later in life (please let me live long) that I'll have a recording of the ordinary things. Like the Thai food I ate in a small town with my husband on a Sunday or the thunderstorm that kept me up all night, or the time I wore a long sleeve shirt on a humid August morning and my neighbor said, 'Waitin' for cool weather?' or the man who runs to the bus stop past my house every morning at 7. All of this I record. + It really helps my drawing skills. Imagine drawing just about everyday, but it doesn't feel like work. I know now how to draw a lot of food, places, people in airports, my dog, red salamanders, flower vases at restaurants - anything is fair game! Do you guys keep visual journals? Travel journals? A way to record your days? Is it a goal you have, but aren't sure how to get started? I think the simplest thing to do is pick up a journal you love - some of mine have dotted pages, some are just blank - and grab a pen! It doesn't have to be fancy, a regular old pen will do, although my favorite to use is the 01 Micron. And remember, nothing is too ordinary to draw. Start simple by writing about your day - what did you see, what do you want to remember? Is there something in your home you can draw? Don't over think it - just start laying down lines. And don't get frustrated if the drawing skills aren't where you want them to be, because every day you'll see your drawings improve, and journaling will be the fulfilling experience it's meant to be. How important is a personal daily drawing practice? Somehow in the midst of becoming an illustrator, my willingness to indulge in drawing for fun just sort of left me. Why waste powerful creative energy on something that might not be of use when I could be spending that energy on my current client project, or planning for something that I know would benefit me later? Drawing for the sake of drawing can fill us with guilt, this is too fun, we think to ourselves, work cannot be this fun. And while I do think illustrators, though essential, are lucky in that we get to do what we love for a living, our work should feel indulgent. That intuitive making, that flow, that creative playfulness is the source of all the good stuff and it builds the foundation for what I hope is a long life of curiosity and artistic fulfillment. Now comes the actual 'doing' part: taking the time to practice outside of a client or expected project. One of my favorite practices has been to draw in the book, Draw Every Day, Draw Every Way by Jennifer Orkin Lewis (you may know her as August Wren!). It shares 365 prompts for daily drawings and I love the way the book is divided into months - each containing its own theme, and suggested materials. Themes range from flowers to food, home to world travel, and the materials suggested include cut paper, markers, watercolor, and white gel pens (to go on the black paper!) I recommend this book all the time and am happy sharing it here - not because this is a sponsored post, I just honestly love it. I'm a stickler for order so I don't skip, but instead I do the book one prompt at a time. In a perfect world, I would commit to doing these drawings everyday without question. In reality, I go through phases. Some weeks, I make it a point to commit 30 minutes of drawing time to myself. Some weeks, I sweep it aside, and disregard its importance entirely. In fact, when I planned to write this post, I found that I hadn't even completed two month's worth in almost three years! WHO AM I? + Daily practices are where the happy accidents happen. Since I'm not drawing for a specific project or client, I am free to experiment, and often use colors, shapes or marks that stretch my comfort level. + I'm challenged to make the best of each prompt. 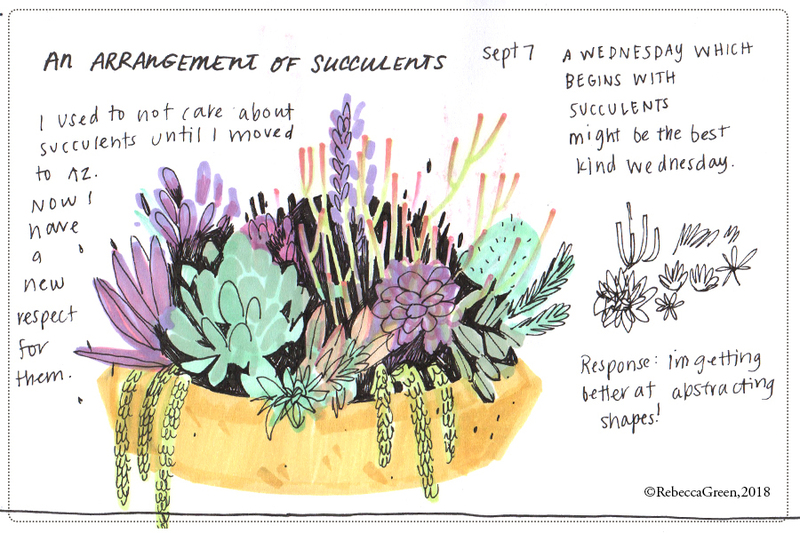 I'll admit it: I hate drawing flowers (which is the first month's theme!). I had to dig deep to find inspiration in a prompt like 'petunias'. The word even now makes me shutter, so I had to come up with a way to turn that into art. Another example was the 'daisy' prompt. I don't like daisies really (sorry daisy lovers!) and I had to dig into the scientific realm, learning that daisies are named Bellis Perennis. Now, if you've read How To Make Friends With A Ghost, you might recall that the girl's name is Bellis - this is where it came from! It's for this reason that I made her a florist in the book. All from a simple drawing that I otherwise would have never sought out. + Daily drawings reveal what I love most about creating. In seeking playfulness in these drawings, I've come to understand myself better. I don't care to just draw objects, rather, I like to build a context, story or character around that object. This often includes researching the history or the science behind the prompt and playing off of that research. Or I'll add a face to the object, write a poem, or a short story! + Putting a limit on the exercise increases spontaneity. When you've only 30 minutes to create a drawing, it frees you from overthinking and overcomplicating the process. What results is sometimes a hurried mess, but other times, it's a fresh and simple result. So there we have it: I daresay daily drawing practices are vital. I look forward to carving out time every day, to draw every way, and to keep the creative flow a'churning. How about you, do you have a daily drawing practice? Is there a book or prompt or system you have to make art a part of everyday? *** This is the first of many weekly blog posts, where I share my thoughts on materials, process, the illustration world and more. Look for a new post each Friday, and if you'd like to stay in the loop, you can sign up for my newsletter by filling out the form on my site! Cheers guys, and happy drawing! Intuition, burnout, and weeping at your drawing desk. [in-too-ish-uh n] noun: Direct perception of truth. Pure, untaught, non inferential knowledge. The best work comes from intuition, for me personally (and I'm sure for many others). I don't know why the concept of following your artistic instinct and intuition wasn't revered in my schooling, but it's something I've come to appreciate in my own process and in the work of others that I admire. In fact, I've been looking for common threads in the work that I love, which spans artists, eras, techniques and style. One of the consistent attributes is the feeling of intuition: the sense that the artist felt compelled, without reason, to shift their work in certain ways. For me, the lack of intuition in my own process leads to a lack of spontaneity, and quite frankly a lack of enjoyment. You hope that if art becomes your job and you're constantly creating, that intuitive making would be the rule, not the exception. Sadly, I have found that the more I make art, the less intuition I have, the less likely I am to trust myself, and the more likely I am to become critical of every decision I make. Trust, to me, is a precursor and pre-requisite for intuition. If I do not trust my inner compass, I can only look for that direction externally, which of course leads to disaster, lack of motivation, and a questioning of my own identity. Being a commercial illustrator can also certainly decrease the amount of trust you have in your own work. You have to balance your voice with the needs of the art director, the editor and authors too. I do love this challenge and am fortunate to work with some of the kindest and most brilliant art directors, but at times I overcomplicate the process instead of just creating from the heart. My heart. All of this overthinking about not over-thinking came to light this year and I struggled to maintain my enthusiasm, ambition, and to be honest, my friendliness. It was personally a rough year for me and was also one of the greatest years of my career. I felt more than ever the need to be outwardly grateful -- because I truly was, and am. But I also felt the incredible need to disappear -- to crawl into a cave and never make art again. I've been freelancing for 8 years and have always experienced an ebb and flow. I've had loads of creative blocks and dug my way under, over or around them. Usually, I take a couple of days off, feel like garbage, mope around, weave in and out of the ever-looming existential crisis and boom! I'm able to get back to it! I'd heard the term 'burnout' before, and always just interchanged the term for creative block. Everyone's burned out at one point or another, whether you're in the creative field of not. We all need breaks and rejuvenation. So when I began feeling a bit overworked and overwhelmed last Summer, I shrugged it off. "After (insert current project), I'll take a break," I told myself. Only the projects and responsibilities continued to pile up. Once my projects were finished and had the stamp of approval, I dug my cave and in I went. I spent most of December doing what I loved outside of art. I made my own pie crusts, and two beautiful galettes. Did yoga. Started reading Oliver Twist. Saw friends. Found out my wax fortune for this year (I will have love for everybody). Visited a museum. Felt guilty for not working. Rearranged my studio. Took hours wrapping Christmas gifts, daydreaming of being a professional gift wrapper. And so on and so on. In retrospect, it sounds like a great and rejuvenating break! In reality, I felt wayward and guilty for my resentment, wondering constantly if I would ever love making art again. I kept waiting for my profound 'AHA!' moment to happen where I just fell back into the arms of the art I love. I teeter as I write this, on the edge of rest and motion. The more I rest and dig into my cave, the more hopeless and despondent I feel. So, I have to embrace motion. Intuitive motion. Taking a break with Mori and June. Moving forward, I'm actually happy to be back at work. Do I feel totally renewed and restored? Not quite. But I think slowly moving with trust and intuition will help guide me back, and keep me leveled in my life and in my work. I've decided to find more time for practice and play. Every Wednesday, in fact, will be devoted to practice, play, and personal work. I will view personal creating and practicing an integral part of my career instead of a luxury. I will seek and find new inspiration and trust my curiosities. I will watch Kiki's Delivery Service. (Thanks for the recommendations IG people!) I will keep studying Japanese. I will keep perfecting my pie crust. As I close, I want to thank each and every person, some of you I've known for years, and some of you I've never met, for your unending amount of support and encouragement this past year. Though I can't respond to each and every comment, email and message, know that I read every word, teared up, felt very grateful, and want to give a big hug to you all. The discussions have made clear that everyone goes through these obstacles, no matter where we are in our creative journey. I do hope sharing my own experience will help you if you ever find yourself weeping at your drawing table or running full speed to escape. Ok. Back to work - slowly but surely. *Special thank you to my girl, Meera Lee Patel for editing my post! New York Times Live Art! Creepy nervous smile before the event began! Totally had butterflies. I carried all my supplies in my Peg & Awl Sendak Artist Roll which I loooove. Chatting with Maria! She's so lovely! Thank you to everyone who joined in, asked wonderful questions and gave praise for the book. I'm truly humbled. And what fun, to talk about making art, when so often it is such a solitary process! A half hour went by fast, and I was unusually calm, despite my nerves! Also HUGE thank you to my girl Meera Lee Patel who took me under her wing in NY (having lived there before). She navigated us through the Subways, showed me the best pizza place in Brooklyn and took photos during the event. (I would have been lost and starving without her.) We also had two other ladies from the Warren in NY (totally lucky coincidence!) Jenny Robinson and Lauren Lowen were there for Watkins business and we got to hang with them! 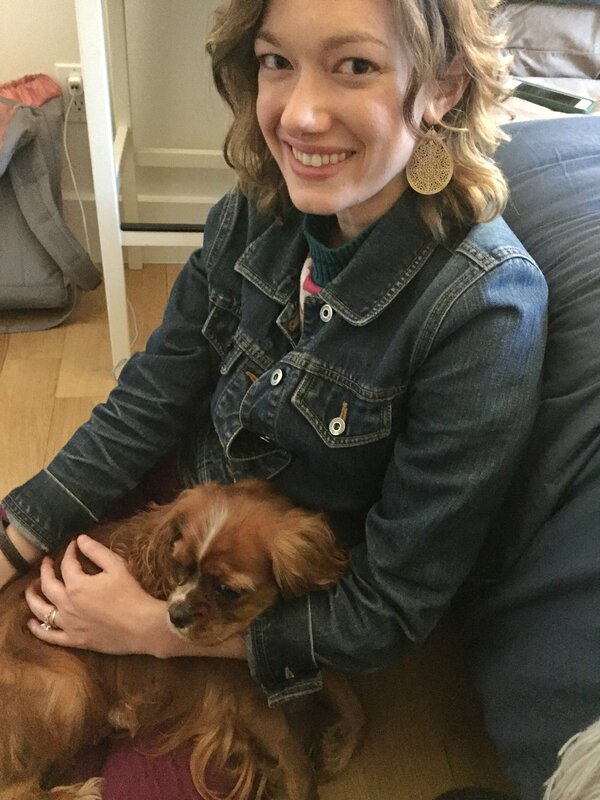 Lauren found a new friend in our Airbnb and we all wanted to steal him. ALSO Books of Wonder was out of Ghost Books so I didn't get to sign them BUT I did see this awesome display for The Glass Town Game, which I illustrated for Simon & Schuster! On the last day, we met up with Mari Andrew, who has a book coming out in April, and who was a serious breath of fresh air. She's funny and real and felt like an immediate friend. We also got to visit with Matthew Forsythe who's work I've long admired. It was a dream to meet him and while it was hard to keep my composure and not let my fangirl come out, it was so great talking about his past and future projects. What a gem! Above, we're pictured in Central Park BECAUSE Meera did a painting video for her upcoming book, My Friend Fear, which I cannot wait to read. Getting to know her these last couple of months has been life giving and I'm so proud of her and her work. Thank you again to Tundra, The New York Times, and everyone who made the trip a dream. Yesterday, not so very far from NY, the book also made its way onto The Morning Show in Toronto for Janet Joy Wilson’s spooky October book picks! Isn't her costume amazing?! She pulled out the best from the book, highlighting the details and the overarching storyline in such a caring way. Thanks again to everyone who watched the NYT video. As you can see, there are loads of artist videos on there that educate and inspire, so dig into them! I know I've got a couple in my queue that I can't wait to watch. Have a spooky Thursday little goblins! PS - Tonight if you're in Nashville, we're having a Halloween drawing night at The Warren - stop by from 6-8! Marshmallows + music + mud tarts and more! Happy Magic Month of October, the very best month in the calendar. 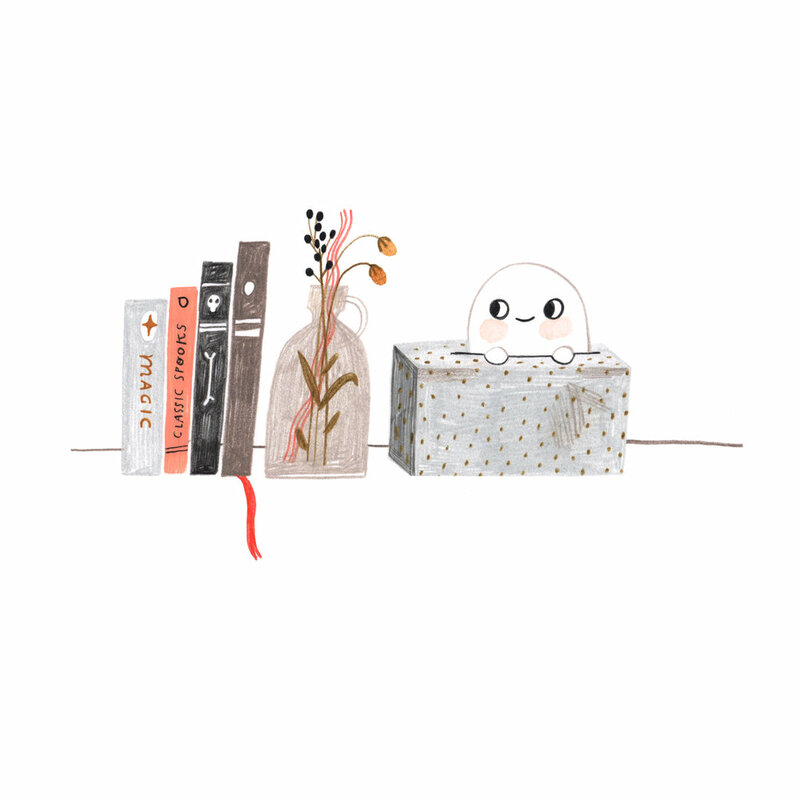 Today I thank you all for making my picture book, How To Make Friends With A Ghost what it is. From those who purchased the first copy years ago, to everyone at Tundra, and to those now who are reading the book, leaving reviews, coming to events, and spreading the word. I'm honestly blown away at the response from everyone, and it makes me beyond happy to share this little ghost with the world. I also want to highlight the incredible work from musicians and chefs alike: we've got a ghost song of the century, and some mind blowing spooky snacks on our hands! Most of you know Emily Arrow, the children's picture book singer songwriter extraordinaire, but if you don't let me introduce you now. She's one of the most knowledgable and fascinating people I've met, and is so passionate about what she does. I'm thankful she was inspired by the book and wrote the sweetest song for it! I can't get enough and it's constantly in my head. Now it can be in your head too! Visit Emily's site to download the song. Once you play it, your ghost will probably want to have a dance party...so get ready to groove! If you've read the book, you know there are quite a few food items that ghosts love: Thunderstorm soup, moldy toast, biscuits with toe jam, and spiderweb sushi. There is also a full recipe in the book for floating spaghetti and mud balls! But a couple of ladies I know have taken ghost snacks to the next level. You're going to love these! Clarissa from Book Nerd Mommy made these mud tarts and they are to die for. Combine oreos, pudding, and gummy worms and you have yourself (and your ghost) and very special treat. She also did the sweetest write up of the book in the post - thank you Clarissa! Us ghost experts (you included if you've read the book!) also know that ghosts can often get mistaken for food items! From marshmallows to eggs, sour cream and whip cream! Well Sylvia, who is a part-time all star chef, and full-time all star publicist at Tundra Books made marshmallows that are ghosts! I didn't even know people could make marshmallows. I still can't even believe this is real. 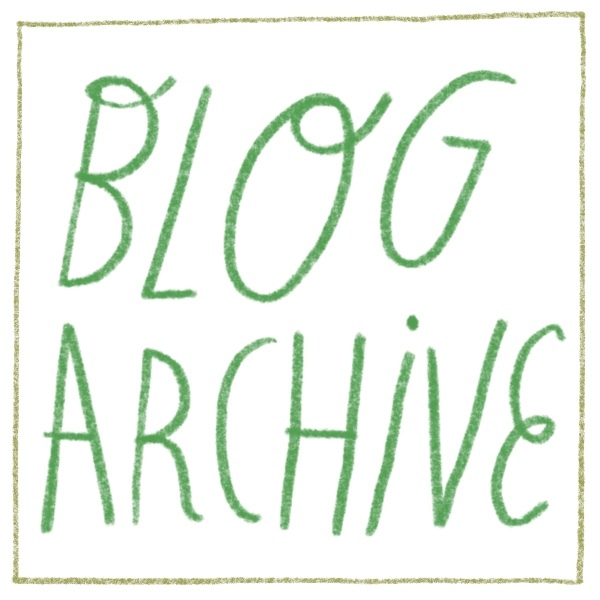 What's even more: She joined up with Danielle Davis, author of Zinnia and The Bees to write a lovely post on her blog, This Picture Book Life! Check out the blog post and recipe HERE! And, last weekend we did a book party at Bookbug in Kalamazoo, MI (my home state!) We had a ghost scavenger hunt, ate cookies, and read the book - it was so lovely! And I got to see some of my old Michigan friends whom I love. Thanks everyone for coming! And thanks Bookbug for having us! My mom, sister and little nephew at the book party! Not pictured were my nieces! If you want to learn more behind the scenes info about the book, I've also contributed to a handful of interviews, as well as a podcast! Check em out! And finallly, it's Friday, so let's do a coloring contest!! Here are the rules! * The prize is a surprise! Annnnnnnnd that's it!! Have an absolutely lovely October weekend my friends! I can't wait to see all these coloring pages! Most paranormal news involves hauntings, sightings, and cemeteries but my ghost news involves cookies, coloring pages, and bookstores, so gather 'round and read all about it. Nothing made me happier than celebrating the launch of How To Make Friends With A Ghost at Parnassus Books. They've been so enthusiastic and supportive of my work, (I just put up a mural in their children's section!) and they were equally avid about my little ghost book and the celebration surrounding it. Karen, Steph and I on the day of the launch - I couldn't have done my event without them! I love these women! Emily on the left and Steph on the right. I'm in good company! 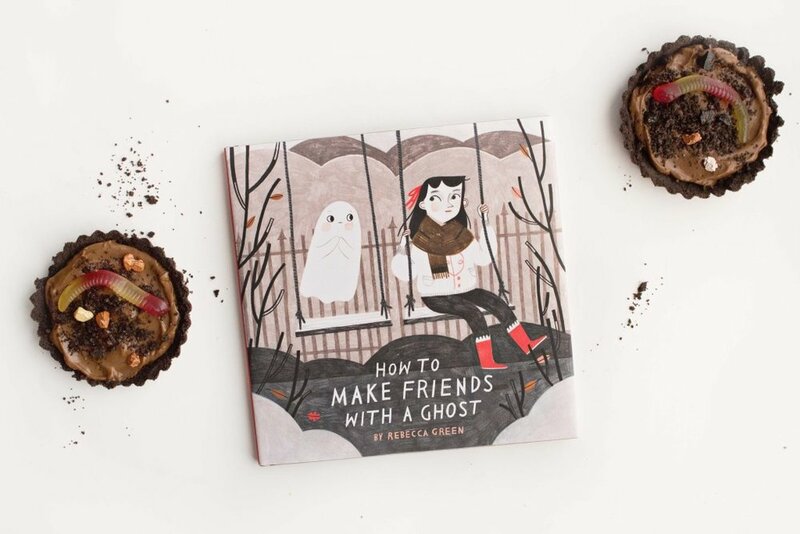 Ghost friends, mud tarts, and earwax truffles! Emily sang and the ghost danced! Thank you to everyone who came out to celebrate the Book Launch - you all made the day so wonderful. Special thank you to the folks at Parnassus, to Emily, and to my husband Matt and my cousin Alex who helped set up! If you came to the launch, then you know Tundra made incredible activity kits for everyone to have, and I also made coloring pages for the littlest ghost lovers. We're happy to share them today with everyone! Download and print Activity Kits HERE and your Coloring Pages HERE. Next week I'll be doing a giveaway, and to enter you'll have to share your finished coloring page, so keep on the lookout for that. GUYS. The second best part about making a book (the first being actually making it) is sharing it with you. I'm happy to announce upcoming bookstore and festival visits, as well as a very special live drawing session. As well as reading to you, I'll be drawing for you too! I'm super excited to share that I'll be doing a facebook live event at the New York Times on October 18 at 3:30 pm EST. Tune in to watch on the New York Times Books Facebook Page! These live events are so cool - I've never done one but I've watched other artists and it's so cool to see them working while folks jump on to ask questions in real time. I've also never been to NY in the Fall so dreams do come true. That's it for today's Ghost News! Thanks for reading and I hope to see you at an upcoming event! Like I said, keep a lookout for a coloring giveaway coming soon. And if you and your little ones do the activities, coloring pages, or share the book on Instagram, use the hashtag #howtomakefriendswithaghost and I'll do my best to share! How To Make Friends With A Ghost - it's almost time! Guys! I have to apologize, if you get my newsletter, you're probably up to date on what I'm sharing today. (If not, sign up on my home page - I promise, my newsletters are few and far between.) Just in case though, I wanted to share all the exciting upcoming events for the release, as well as the official book trailer! As some of you know, I have my very first picture book coming out next month with Tundra Books, and I'm so happy I could fall over. Time to put on the cider, light a fire in the crisp Autumn air, and dive into the world of ghost care. Good thing you can learn everything you need from How To Make Friends With A Ghost! Want to see more? Check out the book's officially official trailer! Let's celebrate Fall and ghost friendships together, shall we? Mark your calendar for the Book Launch Party at Parnassus Books! I'm also happy to announce two upcoming book festivals I'll be part of this Fall. Though the book comes out September 5, you can get a sneak peek at the AJC Decatur Book Festival! I'll be doing a presentation with Tad Hills called BOO! Saturday September 2 at 11:30 am! October 13-14, I'll also be at the Southern Festival of Books here in Nashville! Stayed tuned for more info on that and other school, library, and bookstore visits! YAY! I can't wait for you guys to see this book!